Add milk, flour and water. Mix it well. The consistency of the batter should be such if we pour the batter from the spoon it should fall like a string. There should no lumps in it. Heat ghee in a non-stick kadhai and place a three-and-a-half-inch round, 2-inch high Ghevar mold in the center, so that three-fourth of the height of the mold is immersed in the ghee. When the ghee is smoky hot, take a small glass full of batter. Pour in the center of ghee, slowly in a thin stream. Allow foam to settle. Pour one more glassful in the hole formed in the center. Lower the heat and cook the ghevar until it gets golden brown color. Lift Carefully and put on a plate to drain ghee. Immerse ghever in the warm sugar syrup for twenty minutes, remove and put it a plate. Heat a non-stick pan. Add milk and mawa to make rabdi. Stairwell. The consistency should be thin enough for topping. 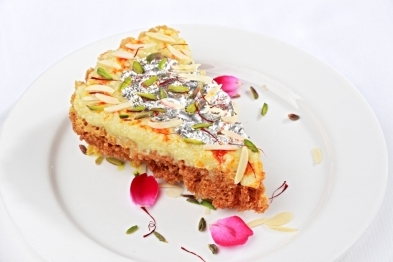 Spread rabdi over the ghevar and garnish with silver leaf and dry nuts. This easy dessert recipe is a delectable delicacy traditionally prepared in Rajasthan but is now popular all over India.